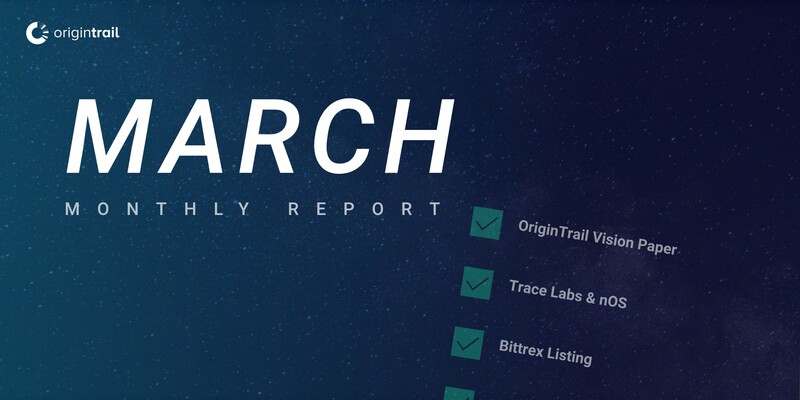 March 2019 was an immensely strong month for the OriginTrail project. We set the foundations for future development and presented Trace Labs as a new brand for the core development company of the open source OriginTrail protocol as well as the growth engine for the OriginTrail ecosystem. This was accompanied by the publication of the OriginTrail Vision Paper, which further outlines our vision of inclusiveness, neutrality and usability, paving the way towards the global adoption of decentralized networks. Much more happened in March, including the Bittrex listing, a very successful SmartAgriHubs kick-off event, strong tech updates, a partnership for halal product traceability and protocol adoption through consumer application. Let’s dive right in! The OriginTrail Vision Paper is the most important strategic document we have published since the OriginTrail White Paper, which was published back in October 2017. The White Paper defined the “what” — the essence of the technology and features of the protocol. It set the foundation for the development of the technology. The Vision Paper, published in March, defines the “how” for the next stage, now that the OriginTrail protocol is live and the OriginTrail Decentralized Network is up and running on the mainnet. The paper explains a strategic shift towards adapting organizations for the optimum of the network, outlines a path towards global adoption, and explains the OriginTrail ecosystem based on the token economy with direct relations between users and network nodes free of arbitrary fees. Furthermore, the OriginTrail Vision Paper includes an updated roadmap. To continue improving on the operational efficiency of serving business communities, the core technology builder organisation for OriginTrail was repositioned and renamed Trace Labs last month. The team will continue improving the technology and distribution channels, and embedding OriginTrail in products to best solve client needs. In addition to developing open source technology for the ODN, Trace Labs also focuses on application-level software built on top of the fundamentals of the OriginTrail protocol as a means of lowering time to deployment and catalysing adoption of OriginTrail technologies. Apart from continuing to develop the open source OriginTrail protocol, Trace Labs has launched the Network Operating System (nOS), powered by OriginTrail, along with an initial bundle of applications needed to onboard user communities on the OriginTrail Decentralised Network. nOS, as a traditional operating system, abstracts lower-layer technical complexities and allows for quicker development, implementation, and a seamless user experience. After the launch of nOS, the friction associated with using decentralised networks has considerably decreased. In March, the OriginTrail ecosystem has seen the addition of the Bittrex exchange as a venue that supports TRAC tokens. Bittrex will also be integrated into the nOS product to handle obtaining TRAC for clients using the nOS. Instead of having to deal with exchanges directly, companies will now be able to utilise the nOS service to obtain TRAC and use it immediately in the ODN without holding crypto-currencies on their books. Similarly, solution providers are also able to use the same service for their applications and even make an integration with the exchanges directly. March saw two important updates to the code of the OriginTrail protocol. Node update v2.0.50 for the OriginTrail Vostok Mainnet included additional support for node connectivity with Ethereum and improvements in the bidding mechanism for the distribution of jobs. Read more. A few days later, the development team introduced node update v3 Freedom, which introduced the litigation mechanisms in the OriginTrail protocol. Freedom was released on the testnet. We encourage the developer community to join in and help the transition to Freedom on the mainnet by running a testnet node and providing improvement proposals and feedback via our development communication channels on GitHub and Discord. Just a few days after unveiling nOS, we were able to share some very exciting news: an application based on the Network Operating System has been launched. Perutnina Ptuj, the largest poultry producer in Southeastern Europe, has revealed a provenance app powered by the OriginTrail protocol. Consumers can now verify data about Perutnina Ptuj products on the blockchain. All data in the provenance app is protected by blockchain technology, which ensures it can no longer be changed once it is entered into the system. Copies of data are stored on the OriginTrail Decentralised Network which is connected to the Ethereum blockchain. The app now includes a Verify on the Blockchain button, which leads the user to the OriginTrail Network Explorer. Read more. The OriginTrail team spent the first week of March in Prague, Czech Republic, at the SmartAgriHubs kick-off event. SmartAgriHubs is a huge Europe-wide project, funded with EUR 20 million by the European Union, connecting more than 160 partners already to work on the digital transformation of the continent’s agricultural and food sector. This conference was the first opportunity for the project partners to come together in one place, meet in person, set the next milestones for the project, and find more opportunities for collaboration. The SmartAgriHubs project is managed by the Wageningen University & Research from the Netherlands — the world’s leading provider of scientific education in the healthy food and living environment domain. OriginTrail plays a key role in one of the flagship innovation experiments, focused on decentralizing data exchange in agri-food supply chains, and is the only blockchain solution provider amongst the partners. The SmartAgriHubs project and managing team are building on the experience from a similar project — Internet of Food and Farm 2020 (IoF2020), which started two years earlier. IoF2020 investigates and fosters a large-scale implementation of Internet of Things (IoT) in the European farming and food sector. It joins more than 70 partners, working on already more than 20 IoT use cases in 5 focus areas: crops, vegetables, fruits, meat, and dairy. Both projects, SmartAgriHubs and IoF2020, joined forces in Prague by organizing their partner events in the same week and collaboratively putting together a synergy day to exchange experience and knowledge among the partners of both projects. This gave OriginTrail an additional opportunity to gain insight into IoT agri-food use cases that are already running, including how they are implementing IoT technologies to the European agriculture and food industry and what the possibilities of combining the OriginTrail blockchain technology with the IoT sensors used and data gathered are. The next SmartAgriHubs event is already coming up in April. This time, it will be a regional event in Serbia that will provide us with an additional opportunity to explore synergies with projects from our partners in the Southeast European regional cluster, as well as Italy and Malta. The OriginTrail protocol will power blockchain-enabled solutions for halal food transparency. OneAgrix, a B2B online marketplace for the sourcing of halal food ingredients and products, announced a partnership with Trace Labs to tackle the trust deficit in the halal goods marketplace, enabling food safety and transparency. This brings tangible benefits to businesses and consumers in the USD 2.5-trillion global halal market. Read more. In March, the 10 Open Call winning teams prepared technical implementation papers, which will be the foundation for their onboarding to the OriginTrail Decentralized Network. At the same time, we shared more details about onboarding timelines with the teams. The aim is to have all the projects successfully up and running on the OriginTrail Decentralized Network by the end of June 2019. After reviewing the technical implementation papers, we will give each team more information and guidelines for their testnet implementation, which should be deployed by the end of May. After getting feedback about their testnet implementation, the teams should aim to launch their projects on the ODN mainnet by the end of June. All the above-mentioned milestones, plus many more, resulted in a very favorable sentiment and a string of strong updates. The community was happy to follow the #ConnectTheDots campaign, which led up to the Trace Labs announcement. In the campaign, we highlighted all aspects of the OriginTrail ecosystem that are important for adoption like technology, partnerships, standards, and education. Our technology partnership with Oracle is as strong as ever. nOS is available to Oracle users through the Oracle Cloud Marketplace and, in March, the OriginTrail protocol was presented by CTO Branimir Rakić at two Oracle’s events — the CEE Partner Executive Forum and the Oracle Technology Day. Strong updates were noted by the general blockchain community in Blockfolio’s weekly highlights and the Ethereum subreddit. Thanks for being with OriginTrail in March. At the beginning of April, we announced a renewed leadership structure for Trace Labs and introduced Jurij Škornik as General Manager. Jurij brings management experience from one of the world’s largest logistics providers, Deutsche Post DHL Group. Stay tuned for more updates in April!